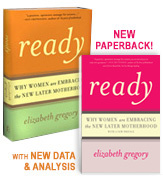 Elizabeth Gregory is the author of Ready: Why Women Are Embracing the New Later Motherhood (Basic Books 2012/2007) and Quotation and Modern American Poetry: “‘Imaginary Gardens with Real Toads'” (Rice UP, 1996), etc. She directs the Women’s, Gender & Sexuality Studies Program at the University of Houston and is also a Professor of English. Elizabeth speaks on a range of topics related to her research: later motherhood, women’s work and fertility, work-family balance, gender equity, and the poetry of Marianne Moore. If you’d like Elizabeth to speak at your event, or for press inquiries, please visit her contact page.